Photogravure from The Army and Navy of the United States. Private Collection. This was one of seven works commissioned by publisher George Barrie as illustrations for his monumental The Army and Navy of the United States, published in Philadelphia, 1889–95. It was reproduced in section 6 as a 13½-by-9-inch photogravure, hand colored in deluxe editions. The image was also issued separately as a black-and-white mounted print. Samuel B. Ringold (1796–1846) was an artillery officer sometimes called the “Father of Modern Artillery” as a result of his several military innovations. He was the first U.S. officer to fall in the Mexican-American War, dying from wounds received during the battle of Palo Alto. Trego’s painting, then, served as a kind of memorial to Ringold. 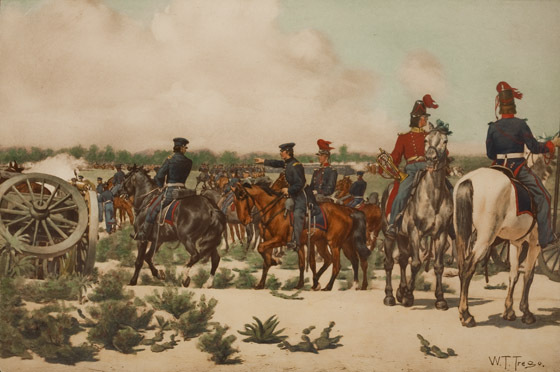 The original for Trego’s painting of Major Ringold apparently does not survive, but an oil study for the mounted officer on the far left hand side of the composition does. It provides evidence that Trego’s work for the George Barrie project was done with the artist’s usual laborious and meticulous planning, which included separate oil studies for all significant figures in a painting.